Also known as arm lift surgery, brachioplasty can revise unattractive features of the upper arm by removing and tightening the excess skin. Due to a potentially visible scar along the length of the upper inner arm patients with mild skin excess are recommended other non-surgical approaches using diets and exercise. However for those patients who have been unable to achieve the results they are after through diet and exercise brachioplasty and the potential scar it comes with is worth the trade-off. Schedule a free consultation with Dr. Griner today to discuss your concerns and goals and determine if brachioplsaty is a good option for you. The goal is to tighten the loose skin and improve the cotour of the upper arm while removing any stretch marks to acheive a more youthful and attractive look to the arm. During the surgery an incision is made along the inner arm from the armpit to the elbow. Then liposuction might be used to remove excess fat and the loose skin will be trimmed away. If needed a tightening technique will be used to tighten the skin. The procedure is done under general anesthesia. Temporary tightness and swelling is common after surgery. Most patients find it helpful to manage the postoperative pain and discomfort with medication that will be prescribed. You’ll need to limit your activity for the first 2-3 weeks after surgery. You’ll be provided with post-operative instructions with more detailed instructions to follow for a fast and successful recovery. 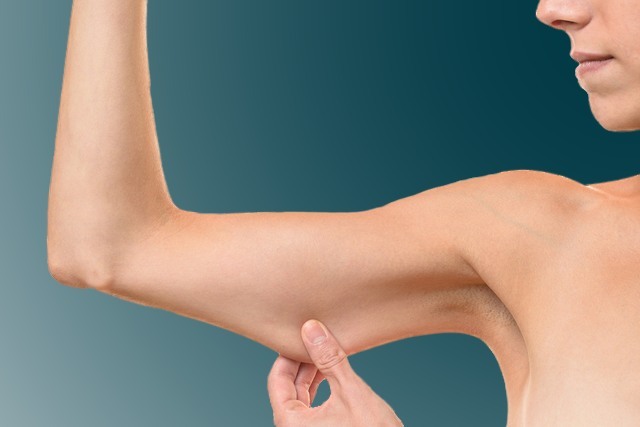 Brachioplasty, most commonly known as “arm lift” is a procedure used to remove loose hanging skin from the arms, usually after a weight loss, as well as from the natural aging process. The excess tissue from the upper arms is removed during the brachioplasty procedure, usually done through direct excision or a combination of liposuction and direct excision. Is there any scarring with brachioplasty? Yes. All body contouring procedures result in some form of scarring. In brachioplasty, a scar should be expected as a straight line from the armpit to the elbow. Dr. Griner can discuss with you options to help reduce the appearance of the scar.